How do Platelet Rich Plasma Injections Work? Platelet rich plasma (PRP) is a medical treatment being used for a wide range of musculoskeletal problems. Platelet rich plasma refers to a sample of blood plasma that has as much as eight times more than the normal amount of platelets. This treatment enhances the body’s natural ability to repair itself and is used to improve healing and shorten recovery time from acute and chronic soft tissue and joint injuries. Many famous athletes — PGA’s Tiger Woods, NBA’s Kobe Bryant and Steph Curry, MLB’s Alex Rodriguez, tennis star Rafael Nadal, and several others — have received PRP for various problems, such as sprained knees and chronic tendon injuries. This treatment technique is relatively new in the field of sports medicine, but has been gaining popularity quickly. Dr. Meyers has extensive experience with PRP as he has been providing this treatment to patients since 2007. Plasma is the clear portion of the blood in which all the other blood components such as platelets, red blood cells, and white blood cells travel. Platelets are part of the blood that circulate around the body ready to help stop the bleeding should you have a cut, broken bone or injury that bleeds internally. Besides containing clotting factors, the platelets release growth factors and proteins that help start the healing process. PRP contains a concentrated amount of platelets that release potent quantities of these growth factors and proteins to stimulate a robust healing response. Collected blood, ready for the centrifuge. Red blood cells settle to the bottom, plasma remains on top. Platelets are in between. 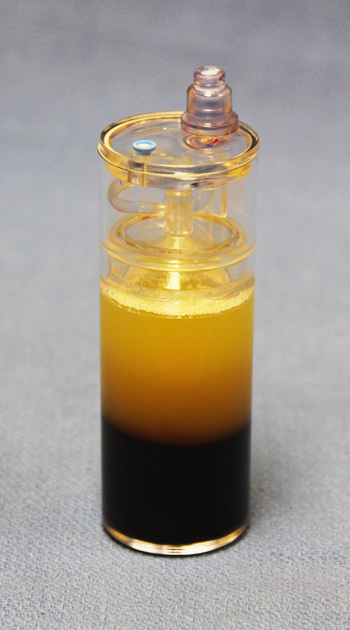 Collecting platelet rich plasma after the separation process. Why Consider Having PRP Treatment? When injury occurs in the body, blood flow is needed to supply the necessary cells and nutrients to drive the healing process. There are certain areas in the body that have very limited blood flow. When injured, these areas with poor blood flow are more difficult to heal than other tissues that have good blood flow. This is especially true of tendons and cartilage including meniscus. So, how can you improve healing potential in tissue that does not have good blood flow? One answer is PRP. Injecting concentrated platelets delivers high volumes of growth factors and proteins that signal and drive your body’s healing response. The main purpose of platelet rich plasma injection is to foster healing where it has not otherwise occurred or to speed up healing as in the case of an acute injury. Platelets release over 30 bioactive proteins and growth factors that enhance tissue regeneration and healing. The growth factors activate multiple types of cells required for tissue healing. They also stimulate protein production needed for regenerative processes including the formation of new blood vessels. The released proteins signal multiple types of healing cells to migrate into the area of injury and stimulate healing by growing new tissue. PRP therapy can benefit patients with painful osteoarthritis or tendonitis involving most joints. It can also be used for acute and chronic muscle injuries, meniscus and labrum injuries, ligament injuries and plantar fasciitis. Typically, the patient has failed conservative treatment options such as rest, medication and physical therapy. However, some patients choose PRP as an initial treatment to speed up healing. You may not be a good candidate for PRP if you are currently being treated for cancer, have an active infection, take high dose Coumadin (warfarin) or if you have multiple medical issues. PRP is performed on an outpatient basis in the office setting. You will want to avoid taking any anti-inflammatory medication or steroids for at least one week prior to PRP treatment as these medicines can negatively affect platelets. Treatment with PRP is separated into two steps: preparing the PRP for injection followed by injecting the PRP into the affected area. First, two tablespoons of blood are drawn from your arm. The blood is placed into a centrifuge which spins the blood fast enough to separate it into layers based on weight. Heavier parts (e.g., red blood cells) stay on the bottom. Platelets and white blood cells spin out just above the red blood cell layer. Plasma fluid makes up the top layer. The middle layer containing the concentrated platelets is collected and will be used for injection. Once you have had your blood drawn, the sample is prepared right away followed by injecting the PRP the same day. You will not be asleep during the procedure. Numbing agents such as lidocaine or marcaine may be used to decrease the injection pain. The whole process typically takes less than one hour. It is critical that the platelets are injected accurately into the area of injury to have maximal effect. Therefore, Dr. Meyers performs all PRP injections with the guidance of musculoskeletal ultrasound imaging to ensure accurate PRP placement. 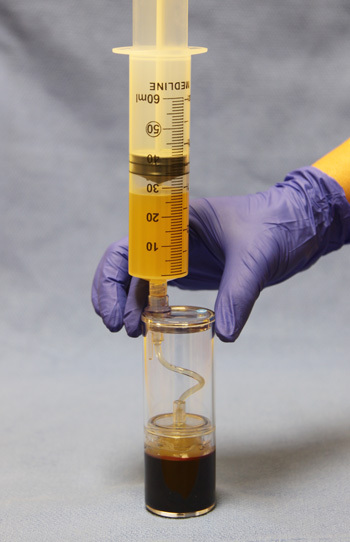 The vast majority of patients only require a single PRP injection. However, some patients may require up to 2 or 3 PRP injections separated by 6-8 weeks to achieve desired results. After PRP injection into your joints, there is usually minimal pain. However, with PRP injection into tendon, there is typically moderate pain for the first few days that may require prescription pain medicine. 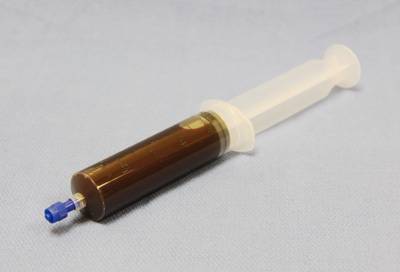 Typically, PRP injections into tendon will require immobilization for a few days after the procedure. Once you return home, you can use ice over the injected area, elevate the leg or arm and limit your activities as much as needed to remain comfortable. You will need to avoid all non-steroidal anti-inflammatory drugs (NSAIDs) such as ibuprofen, naprosyn, Motrin, Advil, Aleve, Celebrex and Mobic as these can block the effect of the platelets. Improvement after PRP injection does not happen overnight. Growing new tendon and healing tissue take time. Most patients see some improvement at one month. But, full improvement can take 10-12 weeks or longer. After tendon PRP, you will typically need physical therapy to help regain motion, strength, and function. Dr. Meyers and his physical therapy department have developed specific therapy protocols to optimize recovery after PRP treatment. Research and clinical data show that PRP treatments are extremely safe with minimal risk for any adverse reaction or complication. Because the injected platelets are produced from your own body, there is no concern for rejection or disease transmission. There is a small risk of infection from any injection, but this is very rare. PRP does not have the risk of negative side effects that can occur with steroid injections or NSAIDs. Published studies suggest an improvement of 80-85% for many soft tissue injuries. In Dr. Meyers’ experience, PRP for chronic tennis elbow is over 90% successful in resolving pain and being able to return to one’s previous level of function including sports. Similar results can be achieved with patellar tendonitis and other areas of tendon injury. PRP for arthritis has been shown to be more effective for pain and last longer than steroids and viscosupplements such as Synvisc, Euflexxa and Supartz. Does my insurance pay for PRP? Unfortunately, even though it is highly effective, PRP is still considered experimental and investigational. Therefore, insurance does not cover this treatment. The cost of PRP treatment is $700 for a single area of injury/joint. Additional injuries/joints can be treated at the same time for as little as $200. Anitua E, et al. New insights into and novel applications for platelet-rich fibrin therapies. Mishra A, et al. Treatment of chronic elbow tendinosis with buffered platelet-rich plasma. Am J of Sports Med 2007. Foster T, et al. Platelet-rich plasma: From basic science to clinical applications. Am J of Sports Med 2009. Peerbooms et al. Positive effect of an autologous platelet concentrate in lateral epicondylitis in a double-blind randomized controlled trial. Am J Sports Med 2010. Fortier L, et al. The role of growth factors in cartilage repair. Clin Ortho Related Research, 2011. Sanchez et al. Ultrasound-guided platelet-rich plasma injections for the treatment of osteoarthritis of the hip. Monto RR. Platelet-rich plasma efficacy versus corticosteroid injection treatment for chronic severe plantar fasciitis. Foot & Ankle Internal 2014. Smith P. Intra-articular Autologous Conditioned Plasma Injections Provide Safe and Efficacious Treatment for Knee Osteoarthritis – An FDA-Sanctioned, Randomized, Double-blind, Placebo-controlled Clinical Trial. Am J Sports Med 2016.